What a midlife wake-up call looks like. What a wake-up call feels like. How to take the important next steps when you get a wake-up call. How wake-up calls can seem obvious but still be surprising. 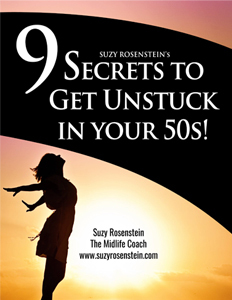 Why milestone birthdays, like turning 50, can really shake you up. The five most common types of wake-up calls. How wake-calls can help you make better decisions and connect with what’s important to you. 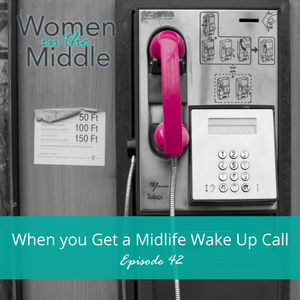 This week’s episode is all about a common occurrence in midlife – getting a wake-up call. We’re going to be talking about what a wake-up call looks like, what a wake-up call feels like, why it’s important to listen to your wake-up call, and how to take the important next steps when a wake-up call has your name on it. Wake-up calls are kind of mysterious. They don’t look the same. They are different for everyone. And you usually don’t know they’re coming. But they’re pretty loud when you get one. A wake-up call is a part of life. Big things happen and you react to them. But what makes a wake-up call unique is they way it shakes you up. You start questioning things. You often take action to re-prioritize aspects of your life. A wake-up call can pack a powerful punch. What’s great about them though, is the way they can help you move yourself out of complacency to focus on what’s really important so you don’t have regrets.